Category 5e, industrial (CM/CMX), 4-pair, SF/UTP copper cable; stranded copper conductors are 24/7 AWG with HDPE insulation. Conductors are twisted in pairs and wrapped with a foam polypropylene tape to form a core. Both pairs are surrounded by an overall braided shield and metallic foil and covered with a TPE jacket for high flex industrial Ethernet applications. The jacket is oil, sunlight, weld splatter, and abrasion resistant for enhanced chemical resistance and mechanical performance. 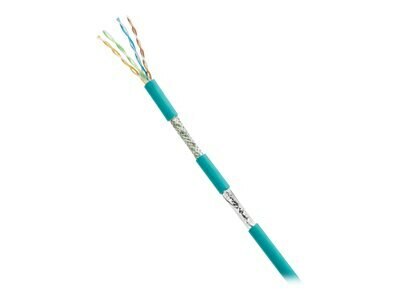 This cable is rated for 600 V panel or on-machine applications when the space is shared with high voltage power cables.